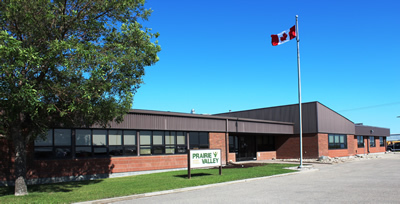 ​Prairie Valley School Division re-elected by acclamation Janet Kotylak to the position of Board Chair and Bert de Gooijer to the position of Vice-Chair at an organizational meeting held November 15, 2017. Both positions are effective immediately for the duration of the 2017-2018 year. "I will work to ensure that students no matter where they live or their personal circumstances receive the resources they need to achieve and succeed." Kotylak said. "As a Board, we will continue supporting high performance at the board table and across the division and we will do this by continuing to reach out to our students and parents, as well as our School Community Council, community, First Nations and local government partners. From Montmartre, Janet has served in the education sector since her election to Montmartre's local school board in in 1997 and she and her husband operate a livestock and grain farm. She is in her sixth consecutive term as Chair and her twelfth year as a Board member. She was also re-elected as Saskatchewan School Boards Association (SSBA) Executive Member representing the Southern Constituency at this week's SSBA Fall Assembly. Bert is from Kelliher and operates a mixed family farm with his wife, and is a graduate from the College of Agriculture at the University of Saskatchewan. This marks Bert's sixth consecutive term as Vice-Chair and his eighteenth year as a Board member. "As a Board, we represent the voice of the public in public education, ensuring that decisions reflect parent and community priorities," said de Gooijer. Bert will also represent the Division on the SSBA Public Section at the Public Section Annual Meeting. "I want to congratulate Bert for six years of outstanding leadership as outgoing SSBA Public Section Chair," Kotylak said. "His dedication to the students of this province is incredible and I am proud to work beside him." The annual organizational meeting also assigns Board members to special committees that reflect the priorities of the Board. The committee structure consists of the Audit and Risk Management Committee and the Planning and Development Committee. Prairie Valley Board of Education holds monthly public meetings during the school year. For information about all Board members and Board meeting information, visit www.pvsd.ca.